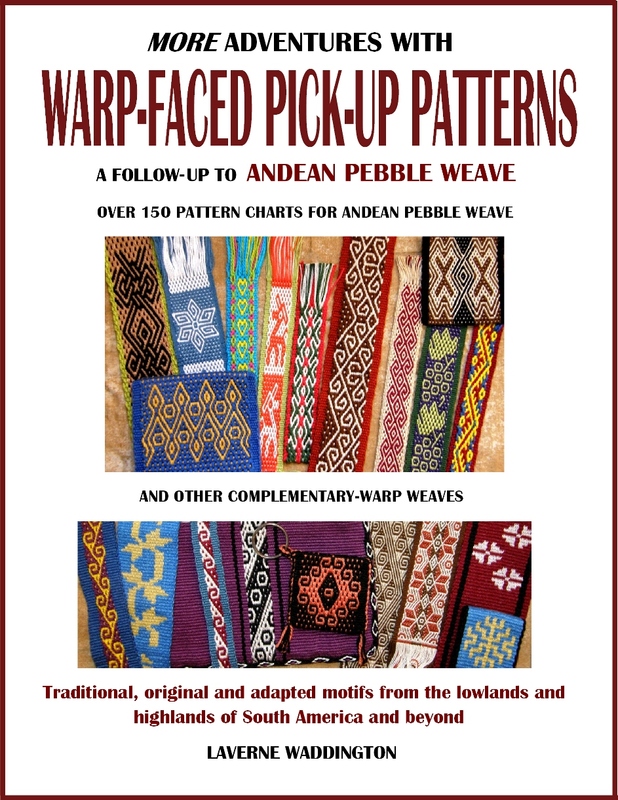 Finally….I am weaving with the right material to suit the season. It’s winter here in Bolivia and, although I am back in a tshirt and shorts today, we have had a couple of weeks of rather chilly weather. I wove with 20/2 wool as I finished the second of two purple panels that I plan to sew together. While doing so, I used the joined brown wool panels that I recently wove as my lap blanket. It was just the right weight for the cool-ish temperatures that we sometimes experience here in our tropical winter. Here are the two finished panels that have been washed and pressed. The one on the left is actually showing its ”wrong” side so you can see how the narrower of the two patterns looks on the reverse. When both ”right” faces are showing, the wider strips of hook patterns on the two panels are mirror images. I created the patterns using black supplementary warp threads. I now have to decide which kind of joining stitch I will use to connect the panels and what I would like to apply to the edges. My brown wool piece has been sitting by waiting for its edging. I have not quite made up my mind about that but I now have the brown wool that I need and just need to make some sketches and plan out the pattern. I am thinking about applying a flat band to the edges rather than a tubular one. In the meantime, I have warped a sample using the same wool I used for my panels for my next project. The item itself is small but there will be quite a lot of time involved as I hope to weave the piece with four selvedges as well as include a tiny pocket and lots of decorative stitching and other embellishments. My short, narrow sample will simply show me how my pattern will look in my chosen colors of 20/2 wool. I want to make a 4-inch wide pouch…the kind people often wear around their necks at conferences. All participants were given one at a conference that I attended and it turned out to be the handiest thing for storing room key cards, meal passes, the business cards of people we had met along with other bits and pieces. 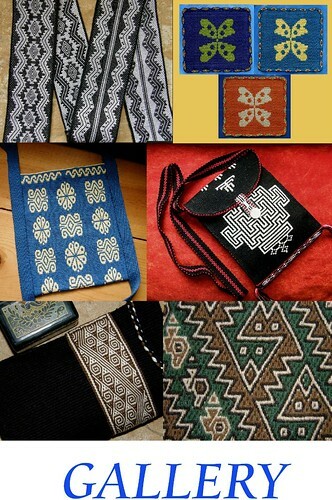 So, I want to weave one of my own and I want it to look like a mini ch’uspa….the woven pouch in which people here in Bolivia carry their coca leaves. Here’s the acrylic ch’uspa I wove with my teachers in Potosi, Bolivia back in 1997. Using her drop spindle, my teacher Hilda added twist to the acrylic yarn that we had bought in the market. The piece has four selvedges and I wove it down on my knees using a horizontal ground loom. Hilda showing me how to finish my first piece with four-selvedges. 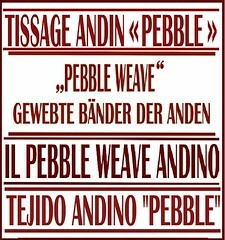 I wove a few inches at both ends of the loom and then, when the space in between was too small to allow me to continue weaving the pick-up pattern, I changed to weaving just horizontal bars. Eventually, the space was too small to allow me to continue using the shed rod. It was removed and I continued using only the heddles for one shed while needle-weaving the other.. I finally had to remove the hedddles and create both sheds using a needle. A shed is created by picking up every other warp end on a needle and then transferring the ends to a very narrow wooden sword or metal rod. Then the weft is passed. It is a slow, slow process. Hilda had helped me finish my first piece this way but for this, my second piece, I was on my own! While Hilda wove a band on a backstrap loom and her sister Juliana cut wool to spin, I wove the fabric for the little pouch on a ground loom. The pouch has the little outer pocket that is typical of many of the Bolivian ch’uspas. I had asked to be shown how to weave a ch’uspa and Julia and Hilda had to consult about how exactly to wind the warp to include the pocket as neither had woven one for many years. Setting up to weave this odd-looking warp is easy enough when using a ground loom. You simply pound stakes into the ground to hold the extra warp-length for the pocket section under tension. It’s a bit more fiddly when using a backstrap loom. Some years ago, I tried it here at home using cotton. The warping and set-up went smoothly but I came to the conclusion that cotton was not a good material for this particular technique….at least not in my hands. So, I am looking forward to trying again with wool. It seems to me that a stretchier material would make things a lot easier. I have turned my woven ch’uspa inside out in the above photos and you can see the little pocket opening. When I had finished weaving the pouch, after having struggled through the final rows of needle weaving, Hilda and I set about decorating it. She taught me to weave and sew a patterned tubular edging. We edged the pocket with a tripled cross-knit looping stitch and then added a finger-loop braided strap. This is the pattern that I hope to use (it is charted in my 2nd book) and my sample will tell me if it is going to look too small in the 20/2 wool. I charted these birds from a small fragment of pre-columbian cloth that Tom Knisely once brought to show me when I was visiting the Mannings. I’ll be embellishing my little pouch in almost every way I know using patterned tubular bands, coil stitches and other decorative sewn finishes, braids and pompoms …it should be a fun project. Yay! 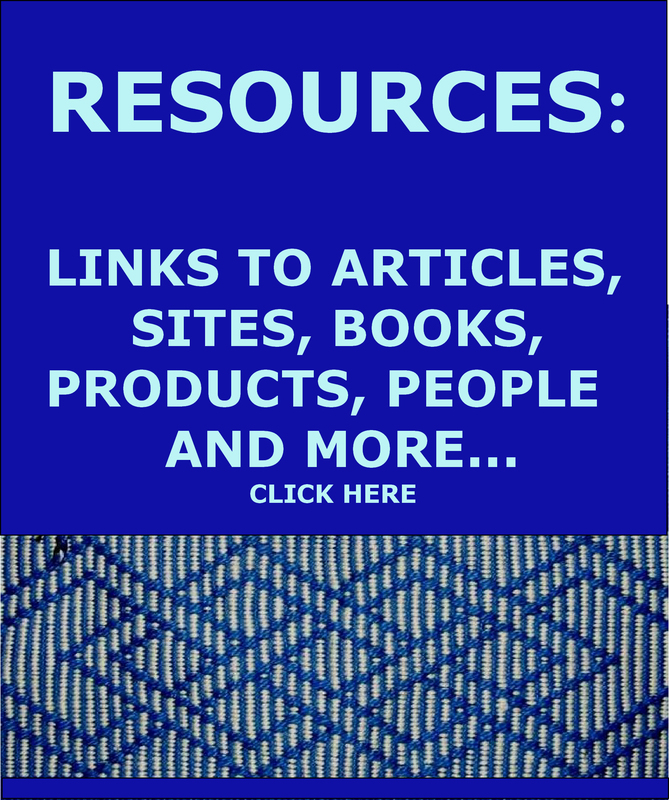 So glad that Thursday blog posts are back! We missed you! thanks for this new post! I’m working on my first ever pouch. 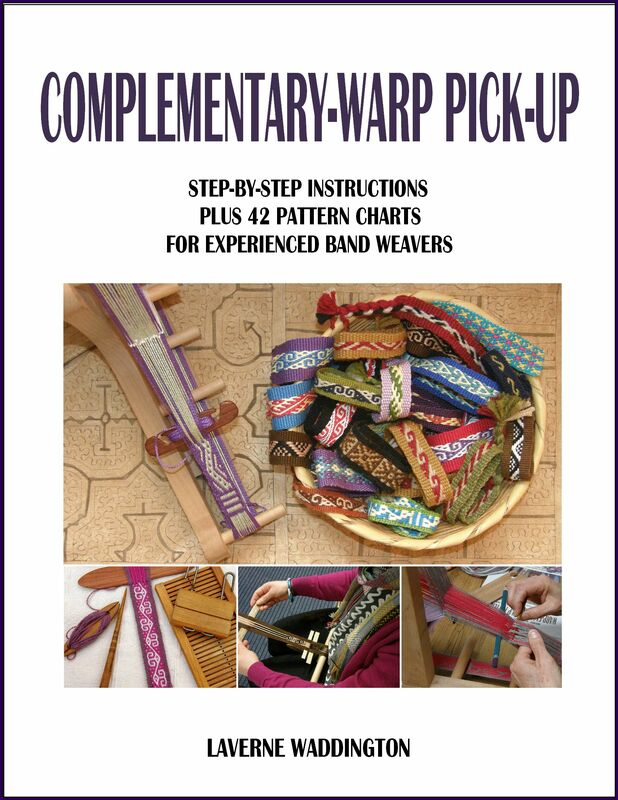 I’m struggling now in making tubular band edgings and a flat strap using only one warp…. Let’s see what will be the result! Greetings from Italy. Great inspiration, as always! See you next month.